Travel blog from a city-break loving traveller, featuring tips on places to see and things to do. 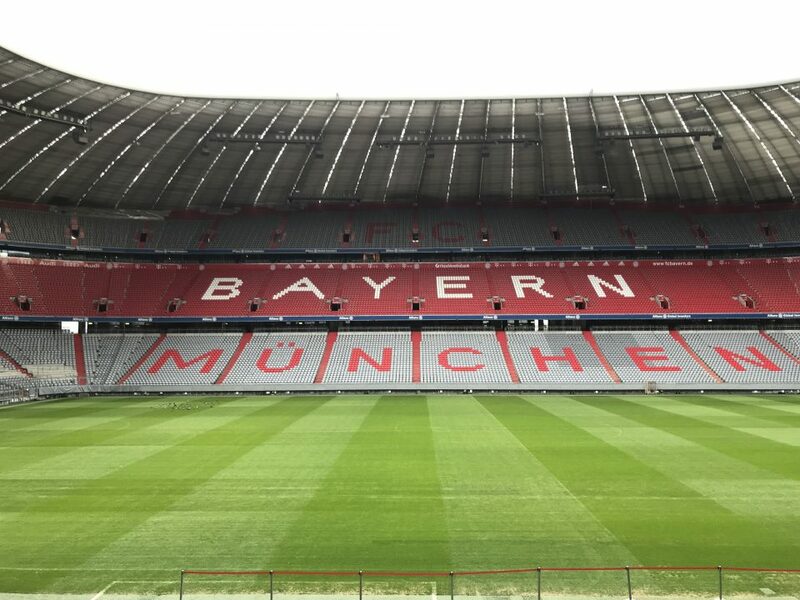 On our last full day in Munich we visited Bayern Munich’s Allianz Arena, the Christmas market and a few pubs too. We had a bit of a lie-in this morning after a great day in Nuremberg yesterday. Once we had some breakfast at Marienplatz we jumped on the U-Bahn for our first destination of the day. Our stop on the tube was Fröttmaning where it was around a 15 minute walk to the Allianz Arena. For such a big stadium, I was surprised that it was located in the middle of nowhere on the outskirts of Munich. There were no pubs or restaurants around the ground either. As a football fan who likes a pint I found it astonishing. We had a good look around outside the ground before making our way inside the stadium to buy our tour tickets. Unfortunately there was a two hour wait for the tour so there was only one thing to be done, a beer inside Bayern’s indoor beer garden! It didn’t resemble a beer garden really, more of a standard restaurant. Before our tour we had a look around Bayern Munich’s museum. The museum told the story of the clubs triumphs, history and key players and managers. It was interesting that they chose to feature their Champions League Final losses to Manchester United and Chelsea too. 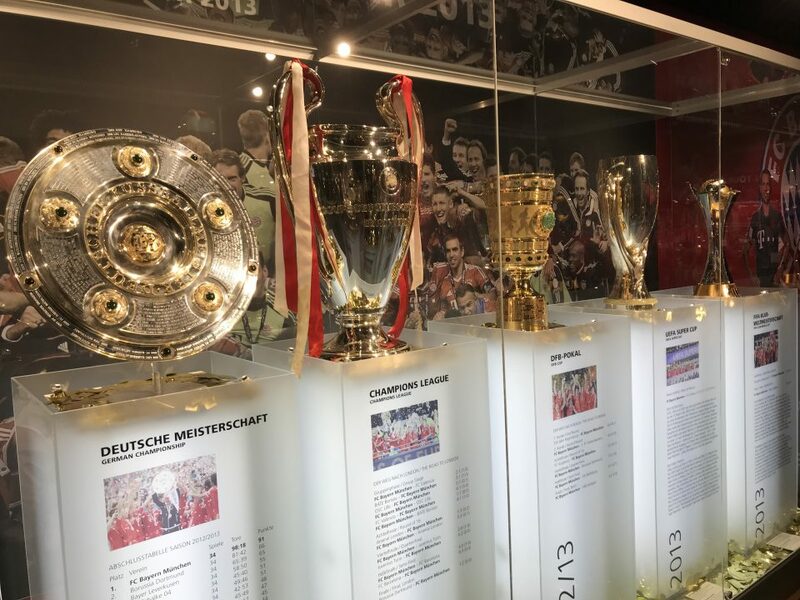 The display of all the Bundesliga titles and DFB Pokel (German FA Cups) were so incredible. But the key display though for me was from the 2013 season with titles from the Bundesliga, DFB Pokel, European Super Cup, World Cup and of course the Champions League. The museum finished at the Club Shop where the wife demanded a Bayern Munich away shirt. I bought it for her to stay in her good books. 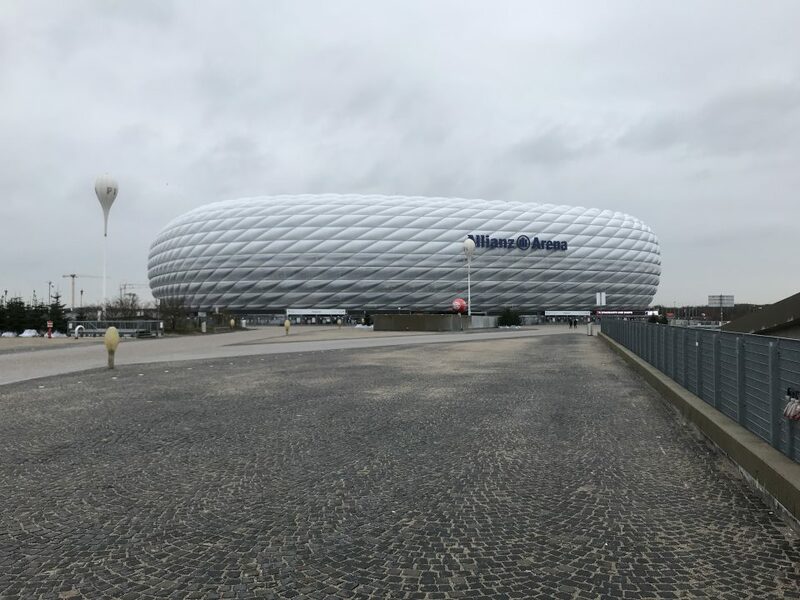 Finally it was time for our tour of the Allianz Arena. Our very animated tour guide called Alfred took us around the stadium to visit the stands, changing rooms, press area and exterior of the stadium. The most notable things I picked up were that the exterior can light up in any colour but they only have planning permission for red (Bayern), blue (1860 Munich) and white (German National Team). However 1860 Munich left the stadium three years ago so it no longer lights up blue. On special occasions they can light it up for different occasions such as green for St Patrick’s Day. Even though I enjoyed the stadium tour, it was unusual that we didn’t visit the dugouts and presidents area like you do at other grounds. Once we got back to Munich we decided to give Hofbräuhaus München a visit for a stein. 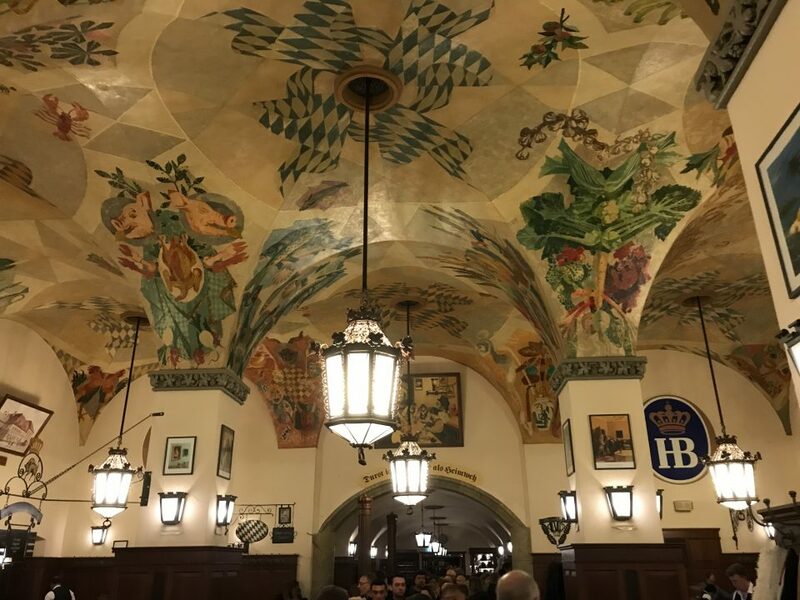 This is Munich’s famous beer house and dates back to the 16th century. It unusual because it is owned by the Bavarian State Government. The ceiling is adorned with Bavarian artwork which was quite unique too. Unfortunately it was full to the brim with tourists so we couldn’t partake in a beer there, but we did walk through it. 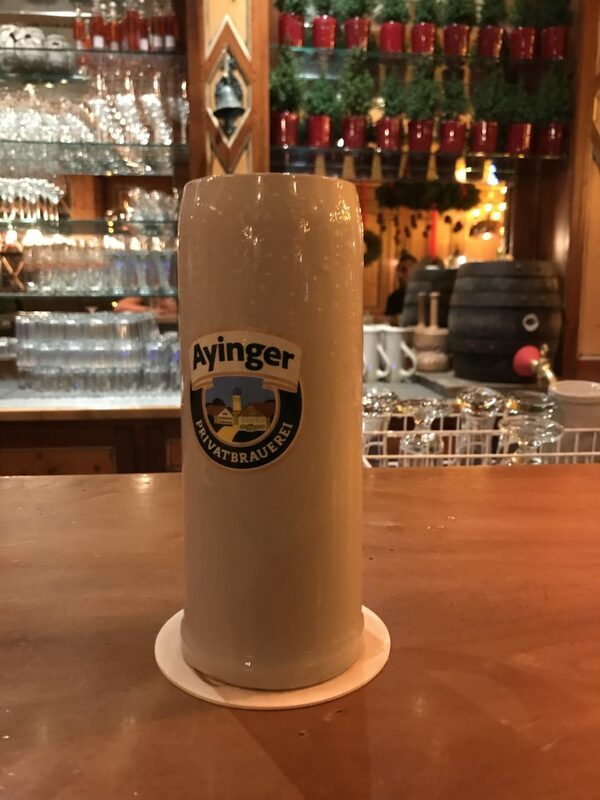 As an alternative we went across the road to a different private brewery called Ayinger am Platzl. This was much calmer and more civilised with delicious beers on offer. I tried the dark beer and a 7% French style white beer. It was much more relaxing than the Hoftbraühaus. 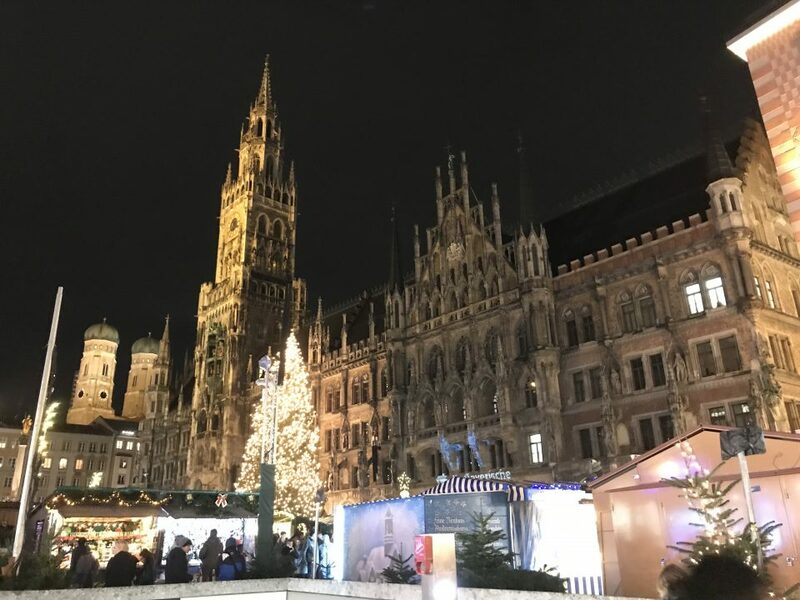 Before our evening meal we had one last look around the Christmas market at Marienplatz. The atmosphere was ok but there were ten times the amount of people than the other day! So much so you couldn’t walk around properly. After a few days of German food at Christmas markets and restaurants we decided on something different. The wife found a Vietnamese and Thai restaurant called Binh Minh just up the road from the hotel. 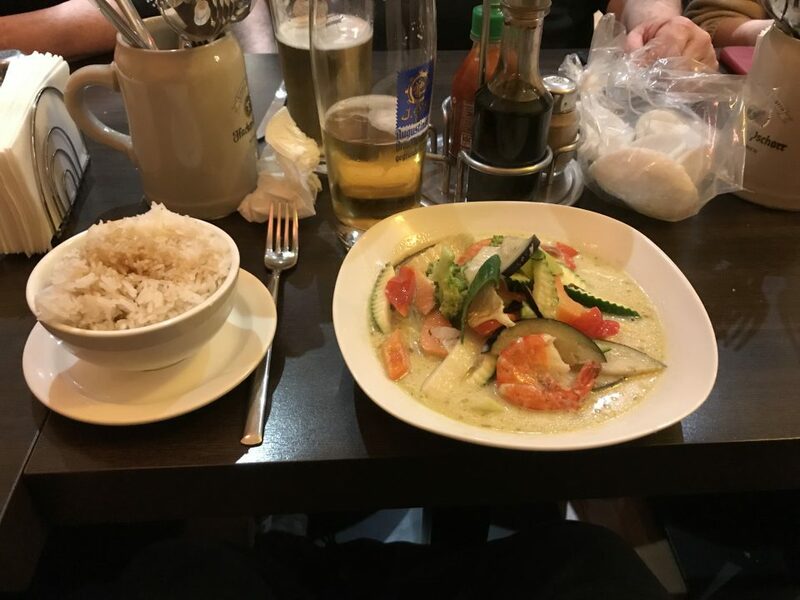 I opted for Vietnamese spring roll for starters and a King Prawn green curry for main. It was delicious. We really had a good time in Munich and Nuremberg this week. Our base for the week was Hotel Royal. 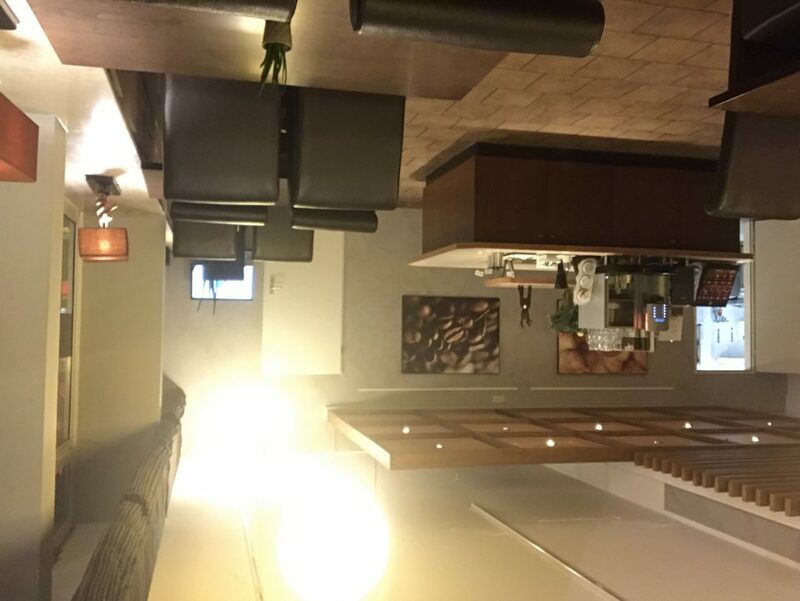 It was only a short walk to the main train station and the rooms were clean and comfortable. Even though the staff could probably be a bit friendlier and the location was between dozens of sleazy strip clubs, I would recommend it. Munich is a great city and we will be back one day. If you are on social media you can also follow us on Twitter or like us on Facebook. Have a look at our photos on Instagram and Flickr. You can also watch our videos on YouTube.